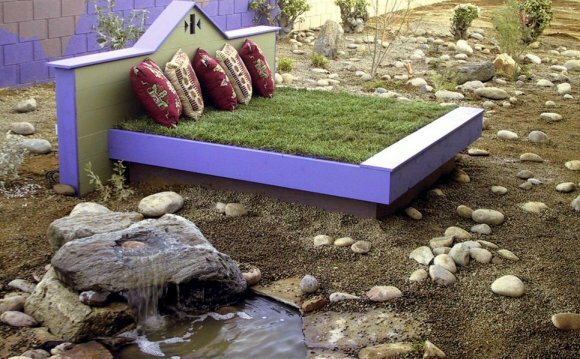 Xeriscape and waterwise gardens are a good idea for Utah’s desert climate. A good xeriscape garden is not zero-scape; it is a beautiful garden filled with color, scent, and variety. Use the seven principles of xeriscape design to save water with your existing plants, renovate an old garden, or plan a new garden. Trees belong in every garden, and with proper planning, planting, and care, they will thrive in a low-water landscape. Xeriscape designs cluster plants with similar water and light requirements together into zones. Each zone is watered separately according to its needs. Locate high water zones (oasis zone) closest to your house and the low water zones (xeric) at the edges of your property. Some zones may need water as often as once a week while others will need watering no more than once a month. If you are converting an existing garden to a xeric garden, draw up plans around the trees and shrubs you want to preserve; perennials and groundcovers can be moved to new locations. You can start small by converting areas into xeriscape zones. Trees will have their own water needs separate from garden areas. Limit lawns to play areas and areas close to the house, and use native grasses as much as possible. The Jordan Valley Conservation Gardens feature varieties of turf that use considerably less water than Kentucky bluegrass. Use groundcovers, such as thyme, to create small lawn-like areas, and incorporate paths, patios, and garden beds to reduce lawn areas. Use mulch and groundcovers under trees. A wide variety of plants work in a xeriscape garden. Use xeric (very low water) plants in exposed, dry, sunny locations on west and south facing areas. North and east facing and shaded areas are better for plants that like more moisture. Don’t mix plants with high and low watering needs in the same planting area. Check Jordan Valley Conservation Gardens’ online database or visit the gardens to see waterwise and Utah-hardy plants in bloom. Many local nurseries feature plants that are suited to our climate. All the trees on the Million Tree list are suited to Utah’s climate but have varying water and light needs. Regardless of the tree, make sure it receives the water it needs to thrive. Utah soils are typically low in organic matter and benefit from the addition of compost. Incorporate compost whenever planting and top-dress with compost in the fall and spring. Many xeric desert plants thrive in lean (low in organic matter) soils but the addition of compost at planting will loosen soil and help it retain moisture. Compost also buffers the alkalinity of Utah soils. Mix organic matter into the soil when planting trees at no more than 25% of the total soil volume.